My frustration comes from the knowledge that those claiming to have black America's empowerment and best interest at heart are the “elephant-in-the-room” problem. They lie to black America. Who are “they”? They are democrats committed to keeping blacks viewing themselves as victims. They are racist bitter black politicians with huge chips on their shoulders, seeking eternal “payback” for America's original sin of slavery. These black politicians are rewarded by the democrats for delivering black votes. So there you have it, black America: these are your so-called advocates. And how do they help you? They lie to you. They tell you that 70% of black youths dropping out of high school is not your fault. They tell you that prisons filled with black males is not their fault. They tell you that 80% of black kids growing up without a father is not your fault. They tell you that black genocide – half of black pregnancies ending in abortion -- is not your fault. The community resented Jewish and Asian store owners in black neighborhoods. I always thought, “Why?” These people did not receive a start-up check from the government. They took a risk. They rented in the black ghetto because it was cheaper. They worked long hours. Experience taught them to install a wall of bullet proof glass, separating them from their customers. Fourteen, fifteen family members lived above their businesses. These Jewish and Asian people were pursuing the American Dream the best way they knew how. What was stopping their black customers from doing the same thing? Answer: In many cases, blacks were relying on democrat welfare programs. I hear you – democrat brainwashed fellow blacks yelling at me: Lloyd, you Uncle Tom SOB! America is racist, and blacks did not have a fair shot in those days! Despite blacks succeeding today in almost every area of American life, democrats continue to portray black Americans as still getting-the-short-end-of-the-stick. 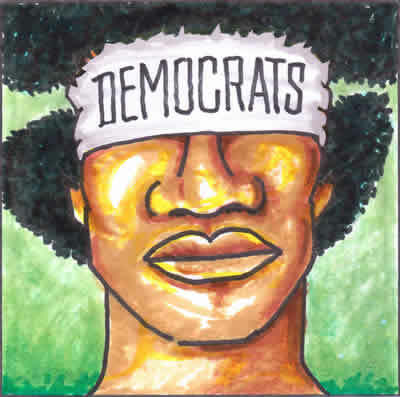 Democrats promote an image of the authentic black experience as a majority in need of government entitlements, as people who can't find their way to acquire ID – sitting at home watching Maury on TV, anxiously awaiting for the results of the DNA test to discover the name of Keysha's baby's daddy. This is the democrat's black America. I am a Republican because the Republican Party respects my intelligence – no special concessions or lowered standards. In the 1950's, my dad was one of the first blacks to break the racist color barrier into the Baltimore Fire Department. The white firefighters rejected my dad and made conditions horrific for him. Still, dad won “Firefighter Of The Year” two times. That's what I am talking about! Given the opportunity, in their typical denigrating of black intellect, democrats would argue that requirements for Firefighter Of The Year be lowered to give my dad a “fair” shot at it. Lowered standards would have robbed dad of the dignity and pride of his achievement. Thank God such was not the case.